How Joe Louis Would Have Beaten Muhammad Ali! In the July 1991 Ring Magazine I had a letter published giving four reasons why I thought Muhammad Ali would have defeated Joe Louis had these two all time great heavyweights ever met in their respective primes. These four reasons sum up how most modern boxing fans think of a potential Ali-Louis battle: 1) Ali had greater speed, especially of foot. 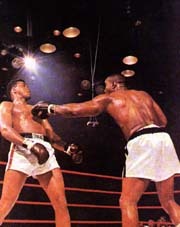 2) Ali had the ability to adapt and change his fight plan while Louis tended to be more robotic. 3) Ali had the better chin and successfully absorbed the bombs of some of boxing’s most dangerous sluggers. 4) Ali was never beaten at his best; his first loss came at age 29. Having grown up as a fan of Muhammad Ali it is sometimes difficult to be objective. I felt a need to prove this popular theory to myself. I began an intensive study of the two great heavyweights particular styles by thoroughly studying films of both fighters, as well as the opinions of other knowledgeable historians and trainers. Within a year I published an article in the May 1992 Boxing Scene “Joe Louis: The Best Heavyweight Ever!" In this article I argued that out of all the heavyweight champions it was Joe Louis who most closely resembled the perfect fighter. I concluded the Louis-Ali match-up as a toss up that could go either way. After more years of study I now firmly believe that Joe Louis could defeat Muhammad Ali. The following describes the how and why. Muhammad Ali has become such a legend that people think of him as invincible. One person wrote to me that Ali was a “demi-god”. I admit it’s pretty impossible to defeat a deity. However, Ali was not a god, but a human being and as such had human frailties. As Jack Dempsey once said “no man has everything.” Ali had a number of weaknesses as a fighter. He did not have an orthodox style and never learned the rudiments of classical boxing. Ali made many tactical errors in the ring. Ali did not know how to properly hold his hands, or how to duck (he pulled back or sidestepped), nor did he know how to parry or to block a jab! In the May 5, 1969 Sports Illustrated, in an article, "Clay-Ali: The Once and Future King", Ali demonstrated how he avoided a jab. He relied on judging the distance and leaning away as in the photograph left He didnt know how to block a jab! If you look at Ali on film, he held his right hand out to the side and did not have it in position to block a jab. That is why Ali had problems with certain fighters like Doug Jones and Norton, fighters with a good left jab could cause him great difficulty. Norton consistently hit Ali with his jab because Ali didn't keep his right hand up to parry Norton’s counter jab. Ali leaned away from punches. He dropped his hands low. He threw a right uppercut from the outside and dropped his right hand every time before he threw it! This is precicely why Ali was vulnerable to the left hook througout his career. A thorough study of film reveals these flaws in Ali's style. These poor habits caused him trouble with quick handed boxers who had solid left hands. So many Ali worshippers are under the impression that Ali was "unhittable" in his prime. This is a myth. George Chuvalo, a limited fighter who lacked both skills had sucess at times against a prime Ali with a body attack. Chuvalo who lacked both speed and hitting accuracy managed to catch Ali flush on the chin with a solid right cross in the 13th round. In both fights with Henry Cooper Ali was hit cleanly by a very average fighter. Even in their second fight Cooper managed to land a fair number of left jabs and hooks as Ali leaned away from punches before Cooper was badly cut. Ali's tactic of leaning away from punches was considered suicidal by the old-timers. This with good reason, such a tactic could be exploited by a good feinter. Fortunately for Ali, the art of feinting has been an all but lost art since WW2, especially amongst heavyweights. Joe Louis, however, did use occasional feints to set up his devastating counter-punches. Caswell Adams of the New York Herald-Tribune wrote, March 31, 1935, "Louis can punch with terrific power...He can feint a foe out of position." By catching Ali coming back after leaning away from a feint, his counter-punches would land with double impact! Ali's chin was among the best in heavyweight history, but no man’s chin is impregnable. Ali was nearly kayoed by Henry Cooper’s left hook. He was very fortunate the punch came at the end of the round. He returned to his corner glassy eyed and his trainer Angelo Dundee used smelling salts in the corner to revive him. Ali also struggled against Doug Jones. The lesson from that fight is not whether Ali deserved the decision, but that a small heavyweight of modest ability was able to be competitive with him. Fighters with quick hands and good left jabs always caused him technical problems. Against Louis, Ali would be facing one of the fastest and most powerful jabbers in boxing history. Carroll also noted that boxers with great footwork such as Conn and Pastor had given Louis trouble. But Ali was not as correct a boxer as Billy Conn or Bob Pastor. Ali had many faults in his style. Joe Frazier nearly knocked him out in the 11th round of their first fight as Ali exposed himself in the corner with his hands down. A crunching left hook, the punch that Ali was vulnerable to throughout his career, had Ali wobbling around the ring in serious trouble. Louis was a faster and by far a more accurate and powerful puncher than Frazier was. He was the finest combination puncher in heavyweight history, and possibly the greatest finisher. If Louis had Ali hurt the way Frazier did in the 11th round there is no way Ali would have survived. Had that been Joe Louis in there instead of Joe Frazier it would have been over! Louis was a deadly finisher and didn't let his man off the hook when hurt. The “Brown Bomber” was the epitome of the hooded assassin. In fact the saying goes "Once Joe Louis had his man hurt...."
Foreman had Ali out on his feet by Muhammad’s own admission (Ali pg. 406-409). George Foreman and Earnie Shavers were arguably heavier hitters than was Louis, but they were not nearly as explosive or quick with their hands. George and Earnie were limited fighters who ran out of gas in the later rounds. Foreman was the heavyweight destroyer non-pareil, who owned the first five rounds of any fight, but by the sixth he was done. 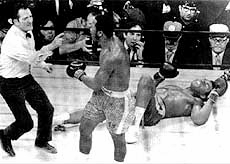 Shavers tried to pace himself in his fight with Ali, and consequently failed to go after him after he had him hurt. Louis had 15 round stamina and kept his power into the late rounds. Louis was a constant knockout threat throughout a fight, while Ali only had to make it though the early rounds against Shavers and Foreman, who threw a lot of wild haymakers, wasting their limited energy. Louis didn’t make that mistake, throwing short, jolting, economically sound punches. Louis would pick his shots and take apart any man who placed himself on the ropes. 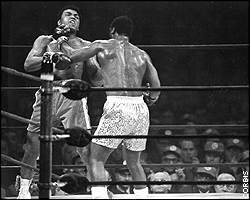 The “rope-a-dope” would not work against Louis, in much the same way it didn’t work against Frazier in Manila. In that fight, he absorbed a terrible beating to the body. “Ali slumped into his corner at the end of the 10th round exhausted and contemplated quitting”, Sports Illustrated, Oct 13, 1975. Joe Frazier fought this battle plan mapped out by Louis in 1967 almost to perfection in 1971. Frazier began working the body early. He punished Ali along the ropes, and when his opening finally came (in the 11th and again in the 15th) Frazier took advantage. Smokin’ Joe failed to score a knockout that day but his victory was decisive. The plan almost worked in the third fight as well, Ali absorbed such a beating he said it was “the closest thing to death” that he had ever experienced. Kenny Norton used a very similar plan. Eddie Futch always believed that Joe Louis had the correct style to exploit Ali's fundamental flaws. He trained Norton to use the same strategy he believed Louis would have employed. Futch instructed Norton, (Anderson p 235), “Your not going to hit Ali by slipping, dropping underneath or parrying. You have to hit him while he’s punching. When he starts to jab you punch with him. Keep your right hand high. His jab will pop into the middle of your glove and then your jab will come right down the pipe…that is what destroyed Ali’s rhythm.” Ali jabbing with his right hand out to the side made him vulnerable to a counter jab. A classic boxer with his rigth hand held in proper position could catch Ali's jab in his glove and counter, Ali would be helpless to avoid it since his hand was not in the correct position. Futch further planned out the following, (p 235), “If you start from the center of the ring it will only take you three steps to get Ali on the ropes. Every time you jab, step in and jab again. Then do the same thing.” Then Eddie told him what to do when he got Ali to the ropes, “Don’t do like all the other guys do. Don’t throw your left hook to the head, he’ll pull back against the ropes and pepper you with counter-punches, instead start banging his body with both hands.” That is how Norton, whose jab, speed, and power was inferior to Joe Louis, gave Ali hell in three very close fights. Joe Louis trainer Jack Blackburn was a master boxer with over 160 pro fights, an all-time great lightweight who fought heavyweights. He was a genius at boxing strategy. Blackburn would have devised a plan to defeat Ali using the same strategy that Joe spoke of in 1967 and used by Futch with Norton. He would have seen the same weaknesses that Frazier and Norton used to defeat Ali. Ali did not hold his right hand in place to block the counter-jab. Chappie Blackburn would tell Joe, “he’s a sucker for a left jab.” Louis had the perfect classic style to defeat Ali. It would not matter that Ali’s jab would “get there first.” Joe would block Ali’s jab with his right glove held high, his chin tucked under his shoulder (see picture left) and counter Ali in the middle of his face with his own jab just as Norton did. He would use the jab to maneuver Ali to the ropes. Joe would put continuous physical and psychological pressure on Ali. Louis would cut off the ring and step Ali towards the ropes, where he would then pound the body. Muhammad would then begin to drop his hands. Blackburn would instruct him “when he drops his right hand to throw the uppercut, deliver the knockout drops with the left hook.” Joe Frazier exploited this same flaw when he dropped Ali in the 15th round of their first fight. Jimmy Braddock was once asked what it was like to get hit by “The Brown Bomber’s” punch, “It ain’t like a punch,” Braddock said. “It’s like somebody nailed you with a crowbar!” -75 Years of The Ring, Vol. 3, No. 1, 1997 Section: The Best Puncher. "All the blows in Joe Louis arsenal were so perfectly and precisely thrown every time that you get the sense watching him that he couldn't have been wild or sloppy if he tried." --William Dettloff in the 2004 Ring Almanac describing his selection of Joe Louis at #1 among the 100 greatest punchers of all time. Louis punches were not just heavy punches like Foreman or Shavers but fast and explosive punches. Ray Arcel, one of the greatest trainers in history worked against Louis in 14 of his fights, said, (Anderson, 120), "Louis once drove Paulino Uzcudin's teeth right through his mouthpiece!" Arcel said it was the hardest punch he ever saw. Not Joe Frazier, not George Foreman, not Earnie Shavers had that kind of dynamite behind their punches. Louis would catch Ali along the ropes with one of his most powerful and deadly hooks. 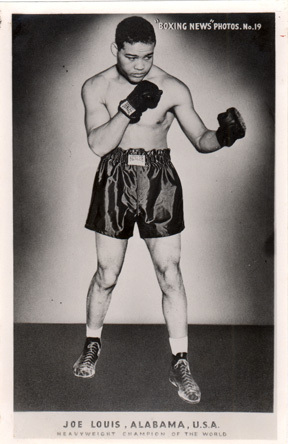 Unlike Frazier, Joe Louis could throw a triple left hook with speed and power as he did against Max Baer. Ali’s legs would turn to jelly. Louis combinations would fire with piston like precision and the power of a human jackhammer. The speed of Louis assault would be mesmerizing. Ali would be battered unmercilessly and unceasingly until the referee was forced to call an end to the execution. Some "analysts" never bother to study films and therefore don't see the technical flaws in Ali's style demonstrated in this article. Instead they make a pointless argument as to how well some of Louis opponents would have done against Ali or the quality of Ali's opposition as compared to Louis. It doesn't matter. Styles make fights. Billy Conn and Max Schmeling did not have Joe Louis physical attributes or his style. Ken Norton had the style to give Ali fits; a right parrying hand to block Ali's jab-a good left jab in return, pressure on the inside, a strong body attack and a good left hook that Ali was susceptible to. Joe Louis had all these attributes and was a faster and far more powerful and explosive puncher than Ken Norton was. Joe Louis was not well prepared for some of his opponents because he didn't know much about them, but any fighter that gave Louis trouble the first time was destroyed in rematches. Louis was 10-0 in return engagements. Louis proved he could make the adjustments to defeat the weaknesses in an opponents style. Ali, despite all his innovativeness, never did understand why Norton gave him so much trouble. It was because Ali didn't know how to block a jab and Norton's trainer Eddie Futch knew how to exploit it. Eddie always believed that Louis had the style to beat Ali. In the March 1992 Ring, Futch picked Louis to stop Ali late in a mythical dream fight. I never understood why until I quit repeating the same old lame arguments and started really studying films. Joe Louis had the style to exploit Ali's technical flaws. While Ali is the fastest heavyweight ever, Louis was nearly as fast with his hands. Ali’s many tactical mistakes would leave him open to one of Louis lightning-like strikes. His foot-speed and jab would be negated by Louis properly placed right parrying hand. Louis would render ineffective Ali’s primary weapon, his left jab, and drive him to the ropes vis-a-vis Ken Norton. Ali was a master of strategy against slow handed bruisers like Liston, Terrell, Foreman, and Shavers. He had more trouble with men with hand speed who could punch with him like Doug Jones, Norton, and Jimmy Young. Louis was superior in hand speed to any of these men. With the previously outlined strategy, which Blackburn and Joe would be sure to implement, Louis would not be at a strategic disadvantage against Ali. Ali had a great chin, but he was not a diety. 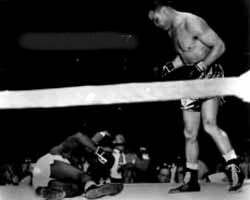 Nat Fleischer rated Joe Louis as the greatest finisher in ring history. Consider that Joe Frazier had Ali in serious trouble and he did not have Louis speed of delivery, combination punching ability, nor was he as deadly a finisher. Had it been Joe Louis he would have kayoed Ali in the first Frazier first fight, and also in the third. Liston, Foreman and Shavers were big punchers but slow of hand, and could not carry on a sustained assault for 15 rounds. Louis definitely would not tire and he was a more explosive and sharper puncher in the mold of a young Mike Tyson. Louis had real shock value in his punches. Ali’s chin would have its greatest test not against Frazier or Foreman but against Joe Louis. Ali was never beaten until a 3-year lay-off, but it was still close to his physical prime he was less than 2 months removed from his 29th birthday. Some would say he lost to Doug Jones, and he was nearly kayoed by Cooper so his unbeaten streak is not without tarnish. In comparing Ali when he retired at age 36 after beating Spinks his record was 56-3 with 37 kayos. Louis when he retired as champion at age 35 was 60-1 with 51 kayos. Louis also lost four of his best years due to WW2 just as Ali lost 3 ½ years in his forced exile. Overall Ali faced the better competition, but Max Schmeling (a first rate counter-puncher), Max Baer (one of the hardest hitters in division history), Arturo Godoy (a strong chinned swarmer), and Jersey Joe Walcott (one of the slickest boxer-punchers of all time) are better than anyone that Ali faced during his prime years, with the exception of Sonny Liston. Both Ali and Louis were dominant champions. Ali had a slight edge in size over Joe. Ali was 6’3” 212 pounds in his prime, and had an 80-inch reach. 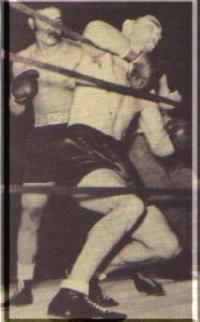 Louis was 6’1 ½”, and about 207, his best weight in his rematches against Buddy Baer and Abe Simon. Louis had a 76” reach. Louis height and reach is about the same as Evander Holyfield. Frazier was 205 in the first Ali-Frazier fight, so any physical advantage is void. Joe Louis had the hand speed, the jab, the power, the stamina, the ring smarts and the style to defeat Muhammad Ali. Joe Louis is the one man who would knock Muhammad Ali out! Boxing Scene. 1995 Spring. Tiger Press Inc. Palisades, NY. “Rocky Marciano vs. Joe Louis. Who Would Have Won In Their Primes?” by Murray Goodman. Ring Magazine. 1966 July. “How would Clay Have Done Against Stars of the Past.” by Ted Carroll. Ring Magazine. 1967 Feb. “How I Would Have Clobbered Clay” by Joe Louis.